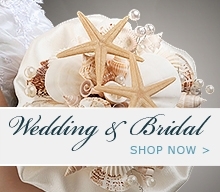 Latest styles in bridal accessories, wedding accessories, ring pillows, guest books, veils, headpieces, card boxes and more. Personalized Photo Backdrop - Mr. & Mrs. The delicate lace embellishments and satin bow make this Candle a perfect accessory to any whimsy wedding. This stunning ivory ring pillow with black lace is a great addition to your wedding ceremony. This chic Guest Book features elegant ruched detailing and a decorative jewelled brooch, a classic complement to any wedding theme. Pair with the matching Penholder for an unforgettable look. This chic Memory Book features elegant ruched detailing and a decorative jewelled brooch, a classic complement to any wedding theme. This chic Ring Pillow features elegant ruched detailing and a decorative jewelled brooch, a classic complement to any wedding theme. This elegant Candle features an intricate floral pattern and is adorned with delicate lace, pearl details and a pretty tulle bow to complete the look. The embroidered blush lace on this ring pillow is lovely against ivory satin. Gathered blush satin and a rhinestone/pearl decoration make this the perfect accessory for a vintage themed wedding. Pillow measures 7". This rustic yet handsome 3.5" x 4.5" burlap boutonniere puts the finishing touches on a groom's ensemble. This unique 'burlap and lace' collection comes with flower basket(FB560), guest book(GB560), pen set(PEN560), garter(LG560) and ring pillow(RP560). Items are packaged separately. Items can be purchased seperate. This camo boutonniere is a great accent for a groom or wedding party that finds pleasure in the outdoors. It measures 4" x 1.75". Show your love of the outdoors with this camouflage ring pillow. This burlap and satin camo ring pillow measures 8" and features assorted feathers and rhinestone accent. Start a new guest book tradition with these country lace guest cards. Wedding wishes, memories or advice can be shared with the wedding couple on these lovely cards. Cards come in a set of 48 and measure 5.5" x 4.25". Sparkling Cubic Zirconia featuring a popular Pear Cut crystal results in beautiful jewelry with understated glamour at is very finest. Will look dazzling now and for years to come. This hankie makes the perfect gift to Dad and special keepsake that will be cherished for years. It is made of cotton and measures 13". Personalized version available. This hankie makes the perfect wedding gift to the bride and special keepsake that will be cherished for years. It is made of cotton and measures 12". Personalized version available. This distinctive hair accessory takes traditional wedding trims and gives them a modern twist. Can be worn alone or along side the popular Bird Cage Veil or headband. Complements a wide range of hair and dress styles.